The Datalogic PowerScan PBT7100 linear imaging barcode reader with Bluetooth wireless technology offers operator freedom from cable entanglement, rugged durability and extremely snappy reading performance all at an affordable price. 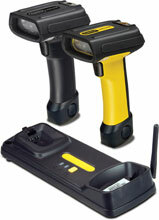 Datalogic Scanning's innovative and unique optical design of the PowerScan PBT7100 combines features that are normally available on different models into a single device: up to 3 mils maximum code resolution, contact to over 3.0 m / 9.8 ft. reading distance on standard paper labels, and wide angle code reading. The result is a versatile, easy to use and intuitive scanner that simplifies any code reading activity. The Datalogic PBT7100-BBK12-US is also known as Data Logic	DTL-PBT7100-BBK12-US	or PBT7100BBK12US	.